You are at:HomeUncategorizedFinding the Funny #5: Should I go with the Don King or the Paula Deen? Finding the Funny #5: Should I go with the Don King or the Paula Deen? In my post about why I’d be an awful contestant on The Bachelor, I mentioned that I had a hair dye allergy. I have tried just about every dye in the store, even the”natural”, no peroxide, ammonia-free type. All of them make me break-out. The way my neck looks after dying my hair, you would think I was running through the forest and tripped neck-first into a patch of poison ivy. So, thinking maybe my hairdresser had a solution, I went to her a couple of months ago. Trying to be cautious, she performed a “patch test” on the back of my neck by swiping some of the dye she’d actually ue. She instructed me to wash it off 30 minutes later with a wet paper towel. I did that and less than a day later, it looked like I was skipping through the edge of the woods and fell neck-first, again, into a patch of poison ivy. Think red/itchy/welps/burns/wounds that don’t fully go away until four weeks later. Have you ever seen someone with mental illness start itching the back of their neck like crazy out of the clear blue? That was me. Flash forward to yesterday. My last hope was Aveda and maybe henna, though I have heard mixed things about using henna dyes. So, really, my last hope of a professional person to dye my hair was Aveda. Every salon I’ve talked with said they don’t use henna dyes. But, Aveda? Aveda was supposed to have the answers anyway. Supposedly, they use more natural products and have “tricks” where they combine lavender and whatever else into their products to help people with sensitive skin. With my 3-year-old by my side, I went into the store yesterday and asked if they could just swipe a dab of the color on the inside of my elbow to see if I would have a reaction. They insisted that they must paint the back of one side of my neck for a reliable patch test. I gave them the squinty eyes and succumbed like a lamb being led to slaughter. It was easy to succumb, because, well, they fixed me really nice tea, gave my son a fancy glass of water, put a magazine in my hand and asked me to sit in one spot until 30 minutes had passed. To top the royal treatment off, they insisted on washing my hair twice and then conditioning it with their rosemary-minty shampoo followed by both of them brushing and blow-drying my hair. ALL FOR FREE. It was heavenly. My hair had never looked so shiny and straight. It looked like I had fallen in poison ivy. Neck-first. Again. Later today, I suspect I will swing by to show them what happened so that, in the future, they don’t insist on doing their artwork on someone’s neck who has claimed awful hair-dye reactions in the past. My Twitter friend @pamtastic of My Pamtastic Life, realizing that this is the most awful thing ever to happen to a human being suggested I start a petition for government funds for Anti-Hair Dye Allergy research. What an awesome idea! We could even have a telethon or something to raise money. WE NEED TO FIND A CURE! I’m inconsolable over here right now! What I’m not fine about? 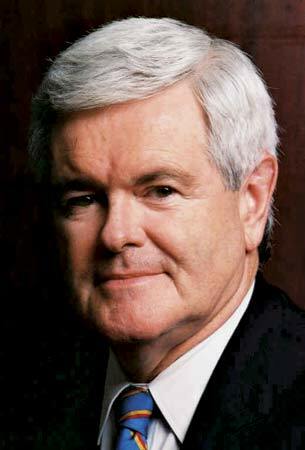 Becoming grayer and grayer and grayer on my head so that my hair color ultimately resembles Newt Gingrich’s in a few short months. Maybe years. But, still. NEWT. STINKIN’.GINGRICH. That is why I need your help. If I’m going to become gray, I at least need to find the right gray hair role model. I need to find the gray hair look that suits me best. I’ve already started to read The Going Gray Blog: Celebrating the Right to Choose. Apparently, there are people out there who embrace the gray and celebrate it! Celebrate even! Would that be you? If you have gray, do you “celebrate” it or cover it up as soon as you see it? Since I may have no other option, I need to find a gray hair-do that will be best for me. I need your help. Which one should I rock? Maybe The Early Sinead O’Connor would be better? It’s “Finding the Funny” time again! Link up any funny posts you have written recently or in the past for our fifth round of Finding the Funny. Week after week, Anna and I are laughing out loud at what you all write and I know this week won’t be any different! Make sure you put the title of your blog post where it asks for “Name” in the linky tool thing. Also, if you talk about it on Twitter, please include the hash tag #findingthefunny. Thank you!